It’s no secret that I live in Michigan (United States). 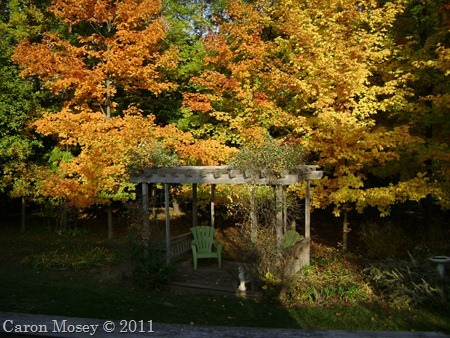 In Michigan, we have four distinct seasons, each unique in climate, activities, and appearance. My favorite season is fall (autumn). 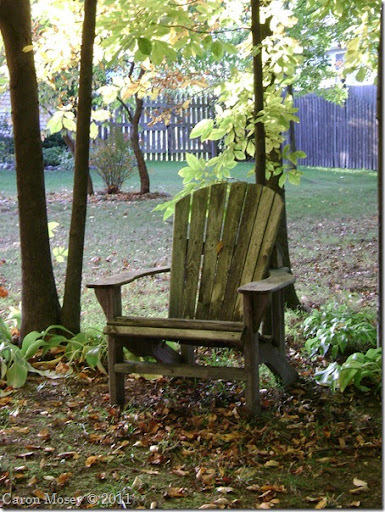 I love the colors of fall: the crispness in the air, the scent of the leaves, and watching the animals and birds prepare for winter. The colors of fall in Michigan inspired my Ocean Waves quilt, shown below. I think this is still my favorite quilt of all that I have made. It was machine pieced and hand quilted. It’s difficult to see from this photo, but the quilt has a lot of half-square triangles in blues and greens, surrounded by flying geese patches in the same colors with pieces of gold and burgundy. The quilt is in the Ocean Waves pattern. 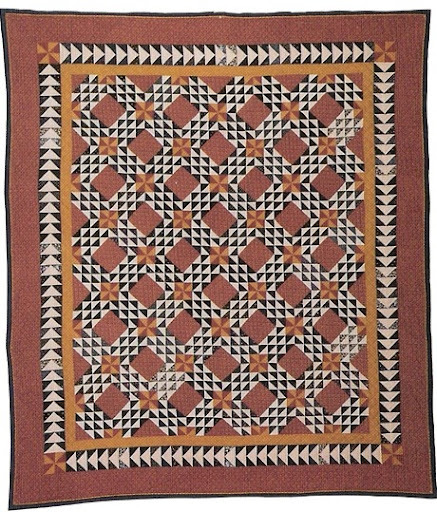 The quilt above is a Bear’s Paw pattern, also with green, rust, tan and burgundy colors. The quilt is all hand pieced and hand quilted. 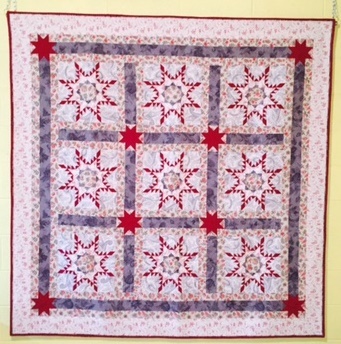 I worked on this quilt during the last few months of my mother’s life as I sat with her. Each time I finished a square, she would put it on her lap and stroke it and say how pretty it was. It’s my favorite quilt to cuddle with. Want to win a free quilting book off my bookshelf? It’s a surprise title, and will be sent to one person who joins in on the fun! I will visit your blog, along with others who will too, and on October 15th will draw a winner! Love your pictures! Love, love, love Michigan! Your Bear Paw story just about broke my heart. I love autumn too, but I think summer is my favorite…it seems so endless at the beginning, and it's the best time to be at the beach! Hm, have I made a quilt using summer colors? I'll have to see! 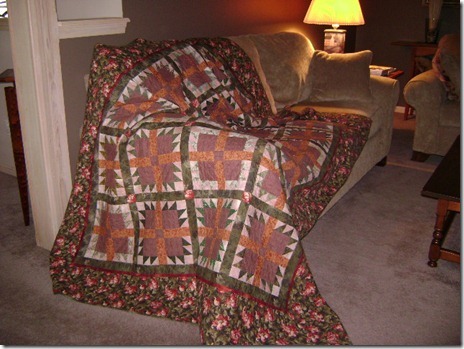 I love these quilts … all the more because they are made by hand. With a halloween birthday, how could I pick any other season as my favorite … but I do miss the beautiful fall colors of Ohio. Japan has lots of reds and golds but not the in-between orangy shades. 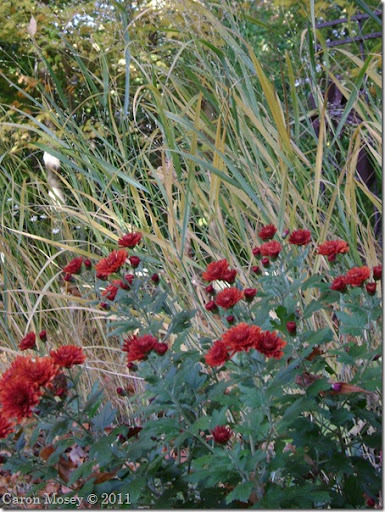 Other than a few table runners, there are not any digiital photos of past quilts in Fall colors.